About 3 hours from Glasgow by car and ferry. Helicopter transport from Glasgow is possible to arrange. Twice daily B.A. flights from Glasgow to Kintyre, then ferry. 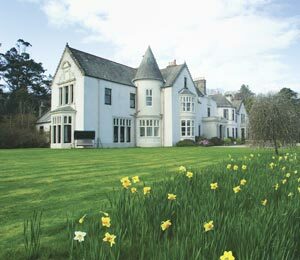 Achamore House is a grand baronial mansion built in 1884 by Captain James Scarlett, set in the midst of 50 acres of the magnificent Achamore Gardens, which were chiefly created by Colonel Sir James Horlick during his ownership of Gigha from 1944 till 1972. Gigha lies at the extremity of the Gulf Stream and as such has a climate of a very temperate nature. 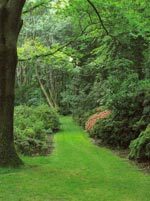 This allows species of plants and shrubs to prosper here which are very rare on the West Coast of Scotland, especially rhododendrons. The walled gardens provide a sheltered habitat for not only rare and unusual plants and trees, but also peacocks! Greenhouses provide an ideal environment for propagating new plants and unusual species. 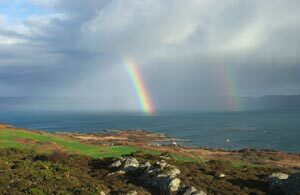 On the 15th March 2002 the Island was purchased in an historic buy-out by the inhabitants of Gigha. The gardens are now entrusted to the people of Gigha and they provide a wonderful backdrop to Achamore House. 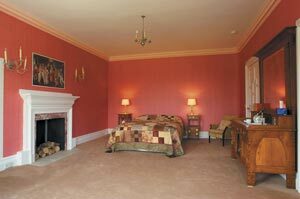 Don Dennis, owner of Achamore House, welcomes guests for bed and breakfast accommodation. It is a beautiful and inspiring place not least because Don runs the International Flower Essence Repertoire (IFER for short) from here, using flower essences that act at the same level of our body as acupuncture does: they effect changes in our c'hi or vital subtle energies. Below left; Colonel Horlick's Room - King size bed, DVD player, bathroom en suite, and bay windows facing east over the gardens. 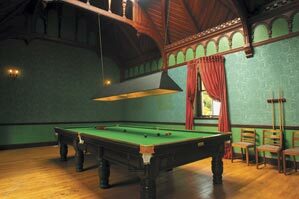 (Can be made a Family Suite by bringing in two single beds). 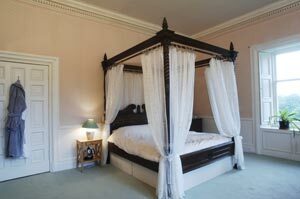 Below right; Bridal Suite with super-king size 4-poster bed and a large south facing bay window. Bathroom en suite. 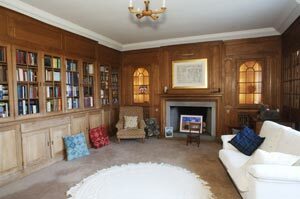 Natural light abounds in this room with the east facing window giving views across the gardens. Don's collection of orchids also share this room, adding colour and a sense of tranquility. 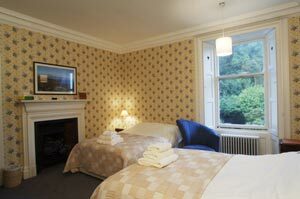 Below left; Room Eight has two double beds, Art Deco furniture and a north-facing window overlooking the gardens giving a lovely light. There is a bathroom immediately across the hall. 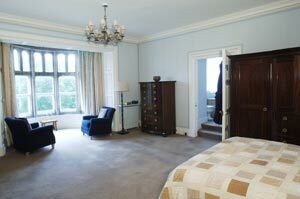 Below right; Tower Suite - King size bed, antique furniture and bathroom in the tower. An east-facing rounded bay window has views over the gardens. 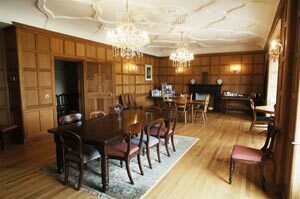 Right; Don and the housekeeper, Mary, cook a delicious breakfast which is served in the Dining Room. Also, with seating for up to 30 people (comfortably, but a few more at a pinch), it is the ideal space for evening meals, prepared by prior arrangement by local chef Viv Oliver. Alternatively there are good places to eat and drink nearby which Don can recommend. 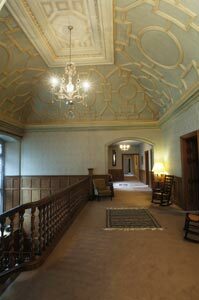 Achamore House also hosts seminars and conferences on flower essences through the year. "Definitely the most comfortable and luxurious night we've had for 3000 miles." WS. & ES, England. "My wife was right - Gigha is as near to heaven as it gets!" NR, England. "Beautiful food. Beautiful people. Thank you." LR, Scotland. "The garden and the house are amazing! Wunderschön! Vielen dank!" MF, Germany. "Don thank you so much for your warm hospitality - we had a wonderful time watching the sunset at the beach & learning snooker - not to mention the whiskey tasting! Many many thanks." MP & SR, Canada. Please tell Don you found Achamore House through About Scotland! The Isle of Gigha is about 3 hours from Glasgow by car and ferry (Tayinloan to Ardminish). Helicopter transport from Glasgow is possible to arrange, and there are twice daily flights with British Airways from Glasgow to the nearby airport of Campbeltown on Kintyre.